Well, anyone with experience looking at strange stuff in photos? 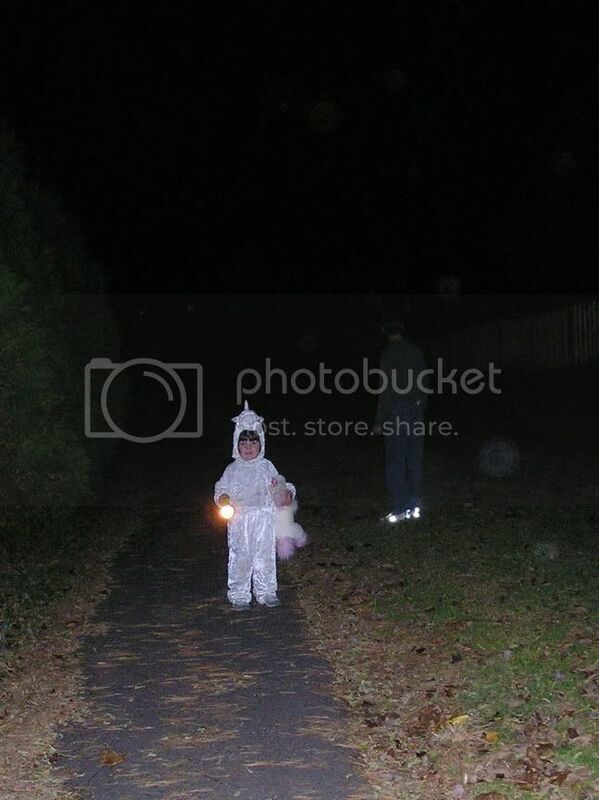 For the last week or so, these orbs have been appearing in photos with my kid. They are only in the photos of her. None of the 15 photos of other family members and pets have orbs. Just Lily, and always at about head level. 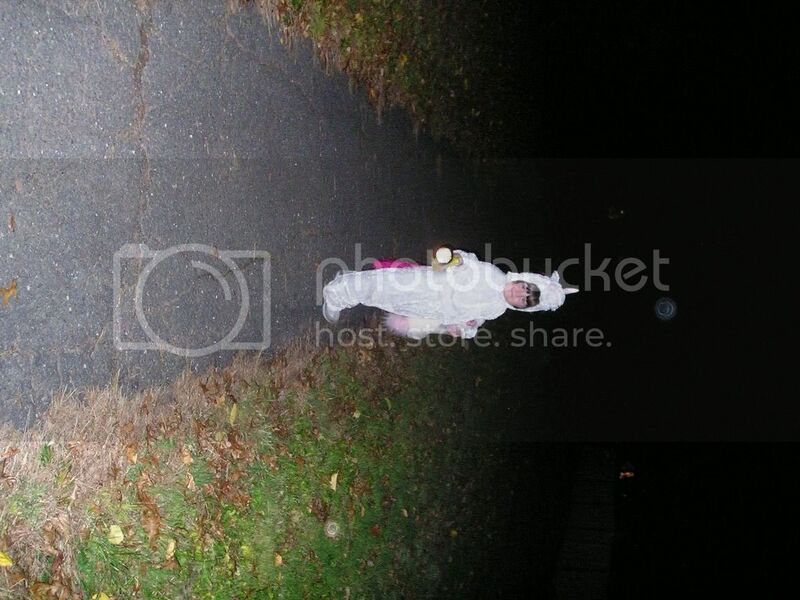 The above shot is cropped from this photo trick-or-treating. Another photo a few moments later. Ignore the woman in costume, and look for the orb on my skirt at her head level. 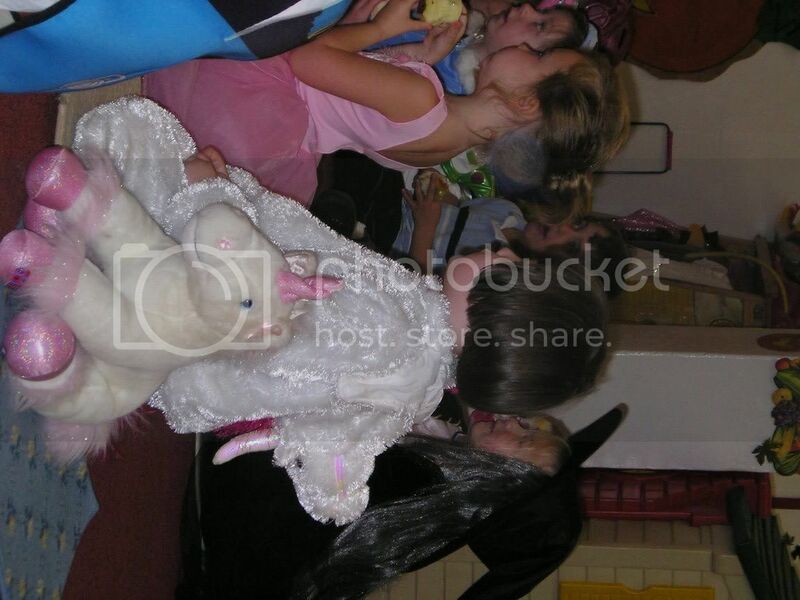 And, at her school Halloween party, a rainbow orb. And there are several more examples. I have an Olympus D-560 digital camera. Any thoughts? Is the "rainbow orb" that spot on the girl's head (left-centerish of picture)? 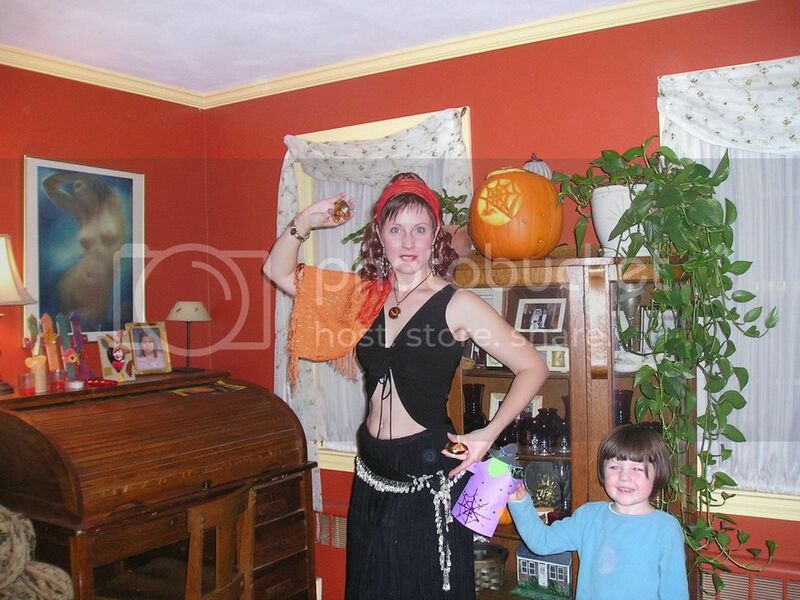 My first thought is that it looks like the orbs happen in roughly the same location in the picture frame in each of the pictures, assuming that the camera was held upside down in either the trick-or-treat pic or the mysterious-costumed-woman pic, and sideways (and cropped) in the school pic. Is that the case? If so, there might be a little spot of something on the lens, or a tiny manufacturing flaw leading to a lens flare. In either of those cases, you would expect that the spot would only be visible when the light is just right, rather than in every picture. Yes, that is the orb on the girl's head. It is roughly in the same spot on all the photos. Not quite as romantic an explanation as a fairy-goddess mother following her around, which is what I've been going with. Well, I'm not saying that's what it is or anything, it was just the first thought that crossed my mind. You could test the theory, by experimenting taking pictures with various lighting conditions and seeing if you can reproduce it. It might be more fun to let it be a faery, though. My son (he's 9) told me the other day that I have the soul of a fairy and that's why I do such beautiful art. He said he could see it around me. Maybe it's her fairy soul. I'm only partly kidding. I like the fairy throry - fairy or guide. Yes, yes, yes, we too! It started when he was around 9 years old, and continued until he was in his mid-teens. The orbs only appeared in photos of him (usually above his head) and even sometimes if he was in the immediate vicinity but not in the actual photograph itself. I have many orb pics, taken with various types of camera, in various places, and in various weather conditions. Unfortunately I don't have scanner, otherwise I would put some up for you. Dawn, those years were very difficult times for us, and so many things could have gone horribly wrong. We even lost every single thing that we owned when our whole city was flattened by an earthquake. I truly and wholeheartedly believe that he was being protected all the while, until he safely reached adulthood. That's what I believe about your Lily, too. Obviously she is a special child with a special purpose in life, and someone out there is keeping an eye on her! Be glad! the one with you and the little girl has an orb on the ceiling where the wall meets the ceiling.